5th sentence, 74th page: I wouldn’t have missed Dot, doing the honours in her wedding-gown; my benison on her bright face! for any money. The title creature is a sort of barometer of life at the home of John Peerybingle and his much younger wife Dot. When things go well, the cricket on the hearth chirps; it is silent when there is sorrow. Tackleton, a jealous old man, poisons John’s mind about Dot, but the cricket through its supernatural powers restores John’s confidence and all ends happily. Although this is a Christmas story, I don’t 100% see the connection. Having said that, I love the tale, and I love the emotional rollercoaster it takes you on. I just didn’t get the overwhelmingly Christmas-y feeling that I get from more modern tales set in the holiday season. Probably because this story had a lot to do with setting up that atmosphere and feeling. Unlike the other Charles Dickens tales that I have recently read, this took me on a really serious roller coaster. Whilst the others did this, it certainly wasn’t to this point, and it made it that much more difficult to put down. The potential treachery of both the wife and the friend are hard, the conspiracy that runs through, and the spirit of the Cricket (which to me translates to the spirit of Christmas) all work incredibly well together. 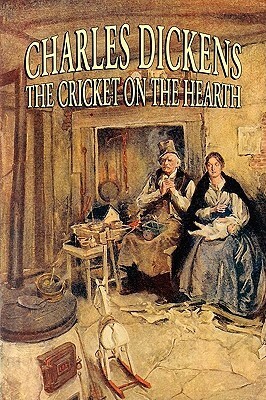 I’m sure there are many potent and incredible meanings behind the words of The Cricket on the Hearth, but for me, it is a great, easy read. Characterised by Dickens’ fantastic style and writing, partnered with the lyrical speech of the 1800s. A great way to spend a slightly windy and blustering afternoon.